In this post, we’ll look at a scalability fix for issues the query rewrite plugin had on performance. Several months ago, Vadim blogged about the impact of a query rewrite plugin on performance. We decided to re-evaluate the latest release of 5.7(5.7.14), which includes fixes for this issue. 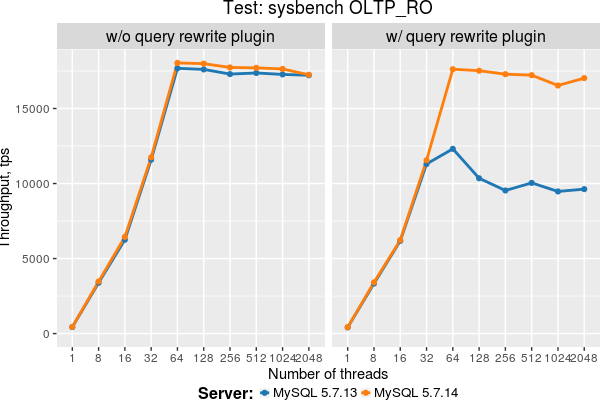 I reran tests for MySQL 5.7.13 and 5.7.14 using the same setup and the same test: sysbench OLTP_RO without and with the query rewrite plugin enabled. No sign of extra locks with the plugin API in PMP for MySQL 5.7.14. Good job! Also, note that the fix for this issue should help to improve performance for any other audit based API plugins. Alexey Stroganov is a Performance Engineer at Percona, where he works on improvements and features that makes Percona Server even more flexible, faster and scalable. Before joining Percona he worked on the performance testings/analysis of MySQL server and it components at MySQL AB/Sun/Oracle for more than ten years. During this time he was focused on performance evaluations, benchmarks, analysis, profiling, various optimizations and tunings.